The Philosophy Smoker: Tercentennial Time! 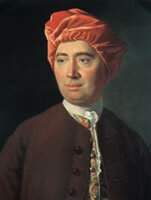 Friday May 6 is the tercentenary of David Hume's birth. Commence to celebrating. Or, if you still use the Julian calendar, it was last week, so send belated birthday greetings with one of those humorous cards. The SEP calls Hume "The most important philosopher ever to write in English." To which Hume might respond, "A wise man proportions his belief to the evidence." Well played, Hume. And happy birthday to a guy who knew how to wear a poofy red hat. And thanks for giving me an excuse to use the word "tercentenary." can't wait for the quatercentenary!! How Did This Year Compare with Last Year? Crowd sourcing peer review? Free open access?